The Razor E200s 2006 version is a new and improved seated electric scooter. Full size deck and frame with powerful speeds up to 12 mph. Seat post and seat easily removed for stand-up riding. Large 8" pneumatic tires for a smooth ride. New chain driven motor and new twist-grip throttle. Designed for young riders, the Razor® Folding Kiddie Kick scooter features a three-wheeled design that helps build coordination and maintain balance. The wide polypropylene deck is slip-resistant, and a new folding mechanism allows easy storage and transportation. Intended for children ages 3 and up. Based on the original kick scooter, this Razor Special Edition Scooter is a handy little ride for kids and teens alike. Though it'll never replace the internal combustion engine, the scooter will get your child from point A to point B much quicker than on foot alone, and requires just a few scoots of one's shoes in the process. Plus, it's a blast to use, as your progeny will likely attest. 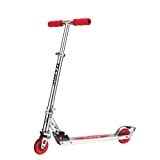 The Razor Special Edition Scooter is built of high quality painted steel construction, a sturdy material that holds up to use and abuse through the years. Its T-tube and deck, meanwhile, fold up into a compact footprint, so riders can fit the scooter inside a bag or carry it at their side when riding isn't appropriate. And thanks to the 98mm inline-style 5 spoke urethane wheels, ABEC 5 bearings, and rear fender brake, riders will always feel smooth and in control when kicking along the sidewalk. Recommended for ages 5 and older. Read and understand the enclosed owners manual before riding. Safety equipment such as a helmet, elbow and knee pads are recommended. Check local laws and regulations to see where and how you may use any Razor product. The Razor A2 Scooter has a new springless front wheel and shock system along with a new wheelie bar and updated deck design. Patented rear fender brake and folding mechanism. Easy to fold and carry as well as convenient to store.